More and more people are turning away from paper cash and using their credit cards and other online mode of payments for purchases. As a result, credit card companies are always issuing new cards and tying rewards to these cards to sweeten consumer interest. Of course, the more credit card users a company has, the more potential income the company can make. But not all credit card companies nor credit card stocks are created equal. 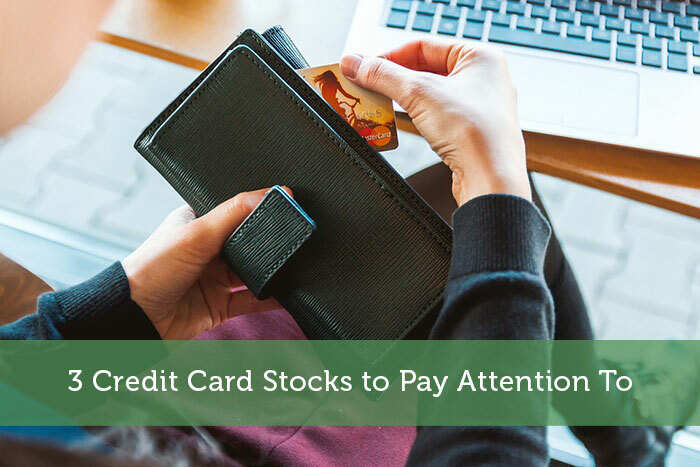 In this post, I am going to highlight 3 credit card stocks that I feel are worth keeping an eye on and potentially investing your money in. Each has a different strategy when it comes to their credit cards, so various factors will be at play for each. Of the major credit card companies out there, Discover Financial Services (NYSE: DFS) is not only the smallest but the one who is most traditional. Even before the credit meltdown in 2008, Discover only offered credit to superprime borrowers. In other words, those customers who reduced the risk of defaulting on credit card debt to the lowest possible percent. Discover Financial Services, through its subsidiaries, operates as a direct banking and payment services company in the United States. The company is currently trading at forward P/E ratio of 7.90. During their recent earnings report, earnings per share came in at $2.03, missing estimates by $0.03 but revenues were up 7.7% at $2.81 billion. The company is getting a lot of investor interest as the bank is one of the most profitable in the segment on the basis of return on equity. The company has also steadily growing its revenue, especially in the Direct Business Segment. Student Loan Portfolio has grown enormously in the last decade. The only downside for Discover is that their credit card isn’t as widely accepted as the others in the space. But with lending offering a healthy stream of revenue, this isn’t an issue. The next credit card stock to look into is American Express (NYSE: AXP). After Costco left American Express out to dry a few years ago, the stock struggled to return to glory. But it finally has. The reasons why investors love this stock is because of the client base American Express caters to. They have affluent customers, who are extremely loyal to the brand. In addition, their credit card users typically spend 2-3 times more than credit card rivals. And that is just the consumer side. American Express has a booming corporate expense business that it has a lock on with an iron fist. The company still makes a bulk of its revenue from the charges it collects from businesses every time its card are used to make payments. With their most recent earnings report, earnings per share came in at $2.32 which beat estimates by $0.52. Revenues were $10.47 billion, up 7.9%. The stock is currently trading at a forward P/E ratio of 12.25. The analysts expect the earnings per share to grow to $8.13 from $7.33 for 2018. If Aesop is right and the tortoise does beat the hare, then American Express is a stock to own as it’s the tortoise compared to the other credit card stocks. OK, I’ll admit that putting Capital One Financial (NYSE: COF) in a credit card stocks post is a stretch. After all, Capital One is one of the world’s largest deposit banks, has an auto finance unit as well as a global financial services business. But the company issues credit cards branded by Visa and MasterCard and these cards are very popular with users. Recent GAAP earnings per share came in at $2.48, beating estimates by $0.09. Revenues were flat at $7.01 billion. Full year 2018 revenue grew 3.08% year-on-year to$28.08 billion. Add into the mix the other business units of Capital One and this stock could be one that many investors are overlooking. So there are 3 credit card stocks to look into. Depending on any pullbacks in the market, you can decide when the best time is to invest in these stocks. As I mentioned earlier, they each have a slightly different business model and as a result, different advantages. One thing though is certain. If interest rates continue to rise and the US economy continues to grow, these credit card stocks could be looking at some very happy times in the coming years.